As 2012 draws to a close, it’s time to reflect on a successful growth year for Bonsucro. The annual conference was held this year at the Museum of London in what was the world’s first dedicated sugar warehouse. 146 people of whom 69 were Bonsucro members participated in the biggest conference to date. Guest speakers included representatives from Bacardi, which is committed to buying 50% certified sugar by 2017 and 100% by 2022; Louis Dreyfus Commodities who’s policy is to manage supply risk by trading visit this in a diversity of sugar based products; Marks & Spencer who’s policy of good governance will be a priority of business to business rather than the current business to consumer, and Raízen which has a strategy to see 100% of its sugar and ethanol Bonsucro certified. After just one year of the certification program, 2.32% of the world’s production of sugarcane is now Bonsucro certified, resulting in the sale of certified sugar and ethanol. 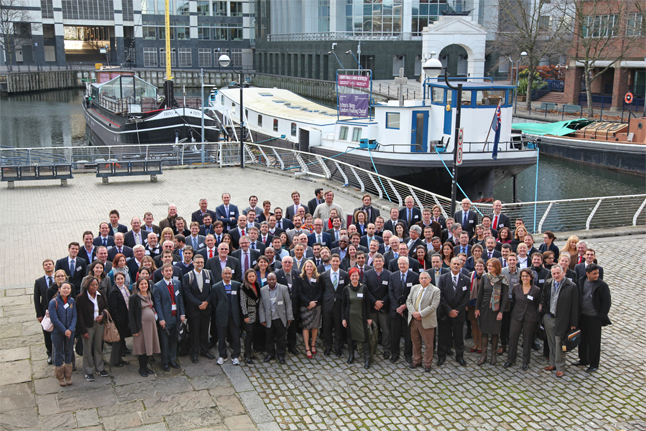 Bonsucro delegates at London Docklands.